Lara Kulikova, native of Siberia/Russia and resident of Seattle, studied enameling and metals in the Abramsevo Institute of Fine Arts in Moscow. Here Lara learned the art of fusing glass onto metal by firing, decorating metals and forming colorful designs. 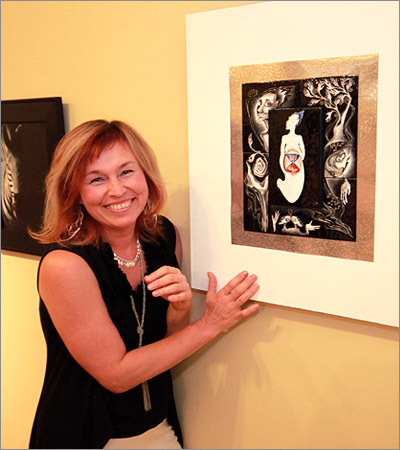 Lara uses cloisonné enameling technique to express her point of perception and tell stories of passion and aging, motion and stillness using art as a visual language, where the arrangement of color, line, symbol and image interlace without a word being spoken. Lara's works have been widely exhibited in the US and abroad. A member of the Enamelist Socity of America and EAFA, she is represented by several regional galleries. Browse the online gallery to see Lara's enamel art. I was born in Siberia in a past century and raised by 2 parrots, Masha, the Moluccan cockatoo, and Grisha, the African gray. During my childhood I was deeply involved in my parrots' life, learned how to fly, how to operate with air streams, and also worked with art artifacts, paper, pencils, brushes and clay. However, my love for fine metal and enamels started as a teen at summer camp where we had metalsmith classes. I become a storyteller of emotional journeys using art as a visual language, where the arrangement of color, line, symbol and image interlace without a word being spoken. I was young and happy at that time, but suddenly my both parrots Masha and Grisha were kidnapped. I followed them spending three months in a ship hold without any food, any walk, any shower. My body didn't want to communicate, my soul rolled up to prevent myself from distraction. One day we finally landed to America and escaped from kidnappers to start another chapter in the book of life. Then I met the Computer, started to surf Internet, swim and dive doing computer graphics, web design, internet marketing and product management. Once I dived too deep... and died without oxygen... I was dead. New life started with a sky, wine, art and birds, few years ago... Thank you to my love, my friends, my family, to all who share my way. A friend of my wrote to me: "What's common between knowledge and imagination? Both are like parrot: knowledge repeats after others, and imagination can fly." I pick the flying imagination over knowledge any day!